The following ensued between Mrs Kemi Ajasa (nee Osho) of Lagos State Internal Revenue and my 18 year old brother,Olatunde Ajasa. I got a call from my brother at about 9pm on Tuesday night (26/6/12). He told me stepmom(Mrs Kemi Ajasa (nee Osho),was going to beat him and I asked why, he explained that Senami (stepdaughter) came to his room to scatter some of his stuffs and he spanked her. And my stepmom started flaring up,raining curses and threatening to beat him. He said she beat him in several parts of his body and was even trying to bite off his manhood that he succeeded in shoving her off . That was when she left him. And started shouting like a mad woman,breaking bottles, threatened to stab him,scattering his room. She called me,shouting and threatening do something to Ola and abruptly cut off the line.I called my dad to ask how bad the situation was,he kept on saying everything is under control, that he's there settling things. I was only able to sleep when I heard my dads younger brother had waded into the issue that night and had succeeded in taken my stepmom to his place to spend the night. Yesterday (27/6/12) ,my mom's call woke me up. She said Stepmom poured hot water on Ola!!!! Unbelievable!!! How can anyone do that? Apparently, there was a missed call on my phone from my brother at about 5am. My dad narrated what happened to me. At abt 4:30am, she and my uncle came back to the house with the intention of settling things. They were all in the living room. Ola was still asleep. 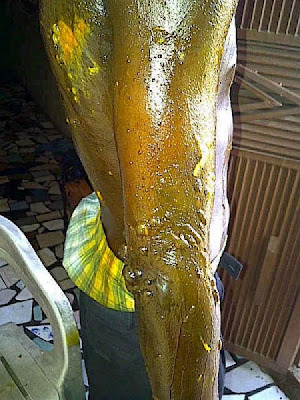 While they were talking, she was going to her room at intervals under the excuse that she was preparing for work , apparently boiling water which she later poured on the sleeping boy leading to serious burn all over his body. My father and Uncle heard the boy scream and saw him saw him staggering into the living room and before they got to him, he fainted. 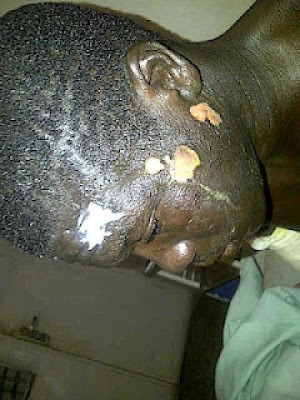 He was rushed to Igando General Hospital(which was the nearest). 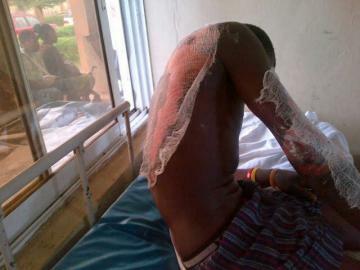 Presently he's responding to treatment at Bee-Hess Hospital Egbeda where he was later transferred to.